Choosing the right fit will ensure that your ugg boots last much longer and are far more comfortable. 1 - Measure both feet from the back of your heel to your longest toe. 2 - Note down the measurement of your longest foot in centimetres. 3 - Match this measurement to the US size on the chart below. If your measurement falls between two sizes, we generally recommend choosing the next size up. The boots should be snug and slip on easily, do not apply force to stretch the boot over your heel. Please note: While our range of Ozwear ugg boots are listed in US sizes, the boots themselves will arrive labelled with the equivalent AU size. Yes, ugg boots will stretch over a period of 1-2 weeks of wear and will gradually mould to the contours of your feet. Please be aware that the thickness of the inner fleece will vary between each and every pair of ugg boots, so no two pairs will feel or fit exactly the same. Our range of Ozwear ugg boots are designed for both men and women, so measuring your feet is the best way to ensure the perfect fit. 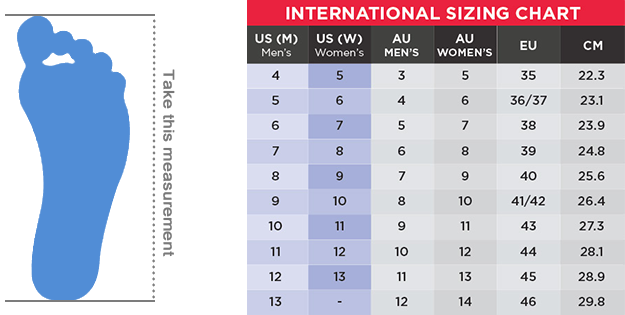 Every ugg boot listing also displays the sizing chart and measuring instructions - please do not simply select a size based on your regular Australian shoe size. Ugg boots are wide-fitting and the naturally springy inner fleece helps cater to all kinds of foot shapes. Ugg boots distribute pressure more effectively than traditional footwear and are suitable for those with wide and swollen feet.